One of the easiest and most fun ways to accelerate your business networking, the concept of “Speed Networking” allows you the unique opportunity to connect with a large number of qualified business owners in a short timeframe. Specifically designed for owners who don’t find ‘pot-luck’ business networking effective, but who’s growth relies on them meeting a diverse range of B2B market-markers, Business Speed Networking will provide you with the opportunity to put your business in front of 20-50 new contacts across the space of a few hours. Entrepreneurs of all types and from all industries are welcome. You need to represent an actively trading business, and be looking for new opportunities to present your solutions to others, as well as learn about and open to referring suitable businesses you meet in the room. We had a lot of success with 2018 events (see below), and are looking forward to very active Business Speed Networking sessions in 2019. Our first BSN event for 2019 which also saw the introduction of Featured Attendees, and new networking opportunities to stay after the official event. We have a wonderfully diverse group of SME owners and BDMs out in force to network at The Common. Read the full event review for some more on this great networking session. Thank you to a large and engaged group of purpose-led, engaged business owners who gathered courtesy of our amazing hosts, @The Common for an afternoon of energetic business networking. Relationships strengthened, new connections were made, referrals, new learnings, and business growth in our community all round. A record event, thanks to everyone involved! 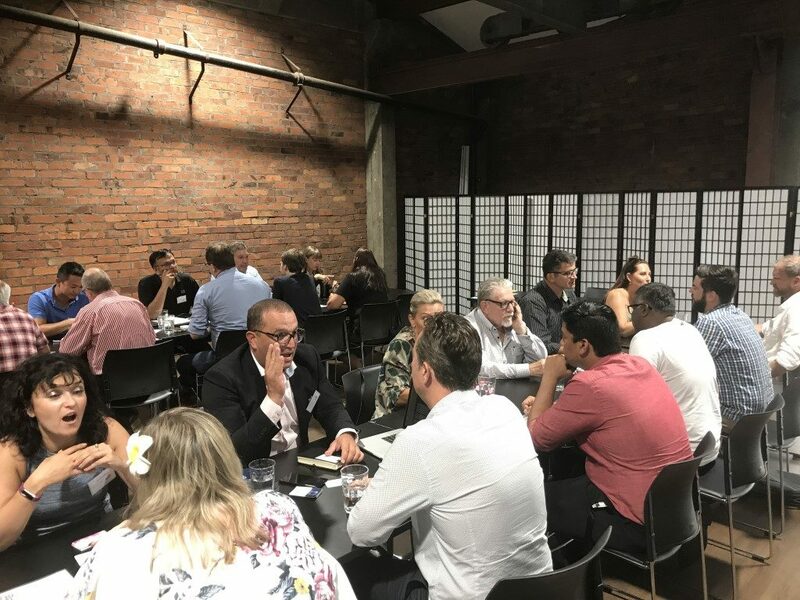 We had more nearly 50 engaged Owners, Managers, and Business Development Professionals some along to share about their organisations and look for business and partnering opportunities in the first Business Speed Networking event. Click the video to the right to see our show reel of the event. What is Business Speed Networking? An easy, enjoyable way to meet new business contacts across a broad cross section of industries, all working to deliver and receive value in products and services that help them achieve the goals of their organisation. Business speed networking is for business owners, directors, business development representatives and connectors, all of whom are looking to both forward their own business objectives and in so doing, contribute to the success of others. You will meet a large number of business contacts in a short period of time, and will be able to quickly identify how you can help them, or they can help you. Exchange details and book relationship development, exploration, or sales meetings right at the event. Everyone participating is looking for the opportunity to build their business through new connections. You will have the opportunity to explore relationships with organisations that you may never meet through traditional marketing or sales & purchasing activity, and these contacts could help you in ways or in industries you hadn’t even considered. Many networking events group people from within the same industry, counter productive for building commercial relationships with people met at the event. Make sure that the organisers know you are committed to coming by completing the preregistration form, which ensures you can will be networking with the best groups for building your business at the event. If circumstances prevent you from attending, make sure your let the organisers know in advance. In most cases that will be to both expand your network of non industry contacts (most events are centered on a specific industry), and also to book meetings with people interested in your product or service. Remember that the greatest leverage you can achieve through networking is second, or third degree contacts so always ask “Who do you know who could benefit from my product or service?” to be warmly introduced to prospects who aren’t even at the event. You will have from 30sec – 2min to introduce what your business does, what kinds of businesses you help, and your company’s “Why” (an excellent place to start). It pays to be prepared, you’ll create a great, credible impression and set your contact up to ask valuable, interesting discovery questions about what you do that will lead to new business. Show up with your networking contact and participate fully in the opportunity to meet, regardless of who you are meeting with. You never get a second chance to make a first impression and many of the worlds most successful business relationships have been founded through the most unlikely of circumstances. Whether paper or electronic, you are going to meet a number of contacts and keeping track of who you want to follow up with is going to be key for success. A name & number is unlikely to be enough for a productive follow up meeting. Note your discussion topic and ideas that came up during your brief discussion, it will set you on the path for success. To follow up, you’ll need contact details be it a business card, linkedIn connection or facebook friend request. Whatever mode of business you use to communicate make sure the contacts you meet are going to be able to reach you after the event to continue the conversation. In the event breaks, use what you already know about new contacts as an effective way to continue a conversation. Its a great opportunity to step beyond the business framework to find out about peoples interests, family, values and goals. Every part of the event is an opportunity to make new discoveries about other business people just like you. An email, IM or other note reminding contacts of your meeting. Even if there is no immediate business opportunity, let them know you will keep them in mind if you see a future opportunity. You never know when this will pay dividends for you as well. Business, even B2B is done across a wide variety of mediums now, and it’s essential to be present on the digital platforms your customers use. Leverage face to face networking to also help you build a presence digitally and be part of the growing business community be it Google, Linked-in, Facebook, or other modern platforms. Ultimately building your connection network at a Business Speed Networking event is about creating an advance, allowing you to spend more time with business connections to explore growth and development together. The people who get the most from business networking are on the front foot when it comes to booking followup meetings, even casual ones, with the new people they meet at the event.